GOOD MORNING! 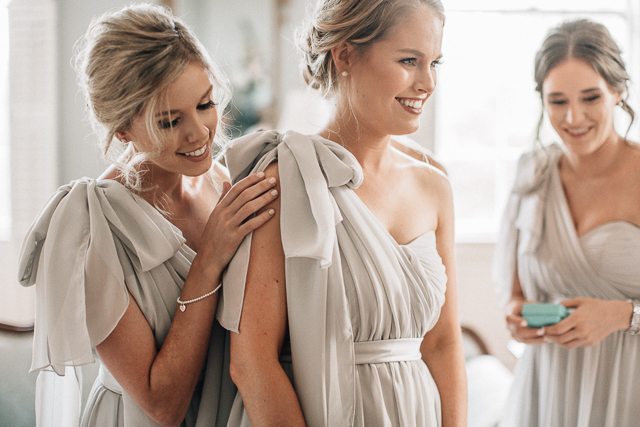 I asked you guys in yesterday’s post what you would like to see on the blog today and the answer was overwhelmingly about bridesmaids stuff 🙂 I’m answering all of your questions in this post, but if I miss anything, feel free to leave a comment and I’ll get back to you there! First up, when I got engaged last May, one of the very first tasks was asking my best friends to be bridesmaids. I had such a hard time deciding what to get them! 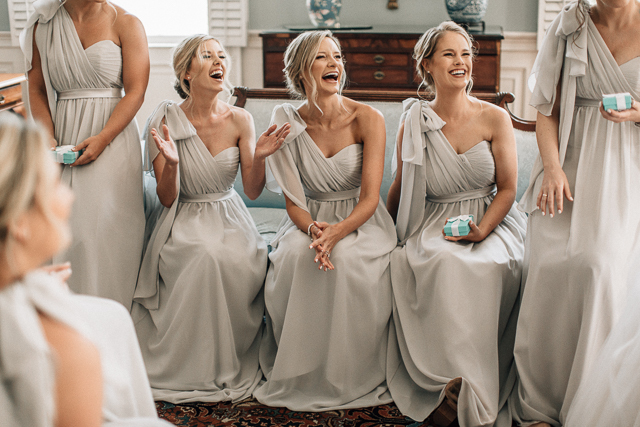 I wanted their gifts to be personalized and fun, and also have a touch of Charleston charm. I decided to put together little “bridesmaid kits” for each girl. 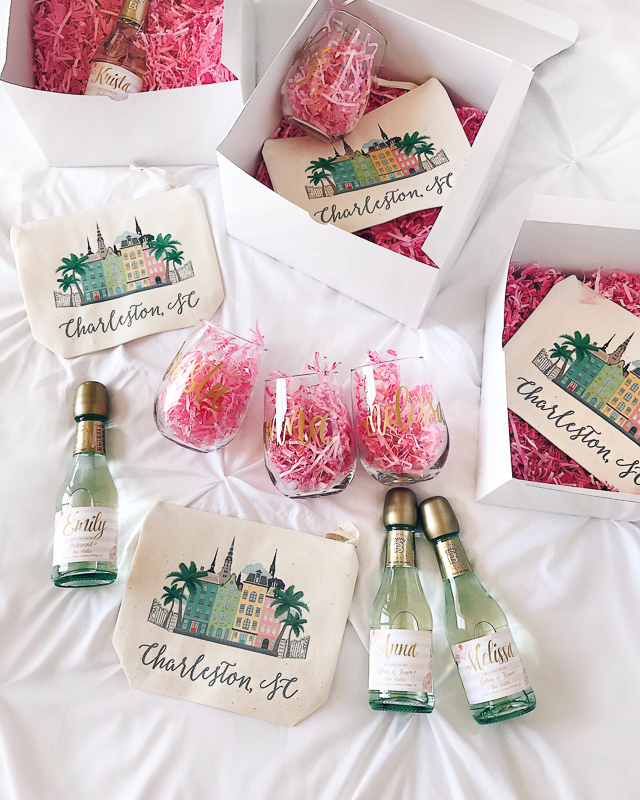 In each box, I placed Charleston cosmetic bags (they also sell a really cute monogrammed version), monogrammed wine glasses, and mini bottles of champagne. 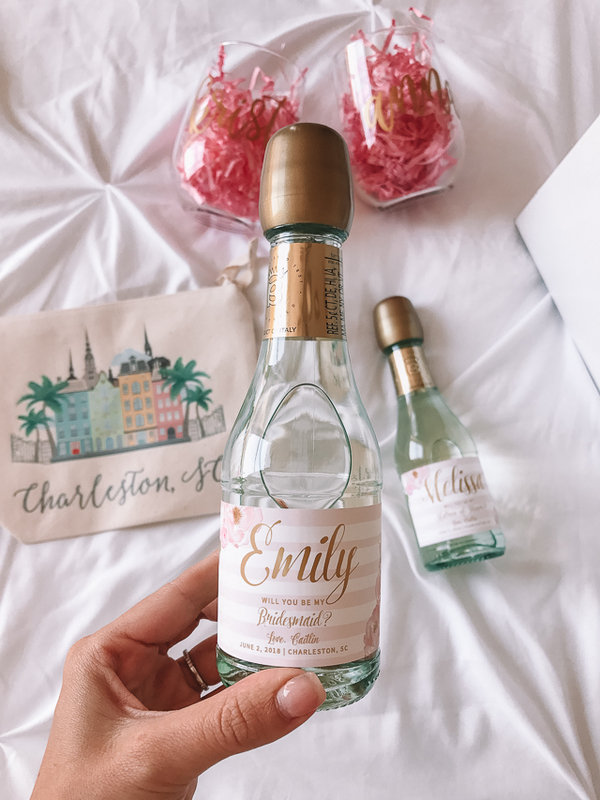 For the champagne bottles, I bought customized bottle labels from Etsy that had the girls’ names and the question, “Will you be my bridesmaid?” printed on them. The hardest part was putting on the wine bottle labels – they took forever to do! I boxed everything up in these white boxes I had ordered off Etsy with a bunch of pink crinkle paper, and added my own card inside as well. I was able to give a couple girls their boxes in person, but the rest I shipped through UPS (side note: if the package has alcohol it must be shipped through UPS and not the post office!). All my girls said yes (love you guys! ), so let’s fast forward to the big day!! The girls arrived at the Thomas Bennett House (our venue) to get ready around 9 am on the morning of our wedding day. 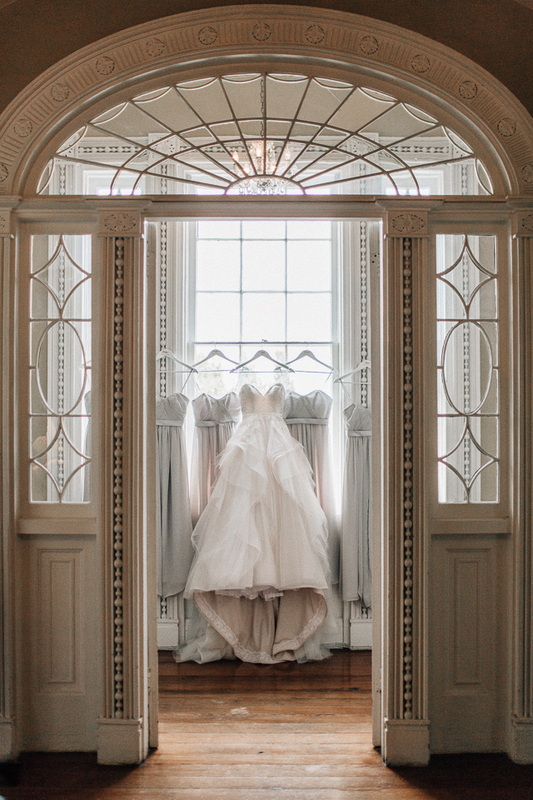 We had the entire top floor of our venue to get ready in, which was amazing! The whole morning ended up being so fun! Lindsey got started on everyone’s makeup right away, and we played loud music, had girl talk and munched on hummus and veggies. We also kept peeking out the windows to try to see the decor and flowers, haha! 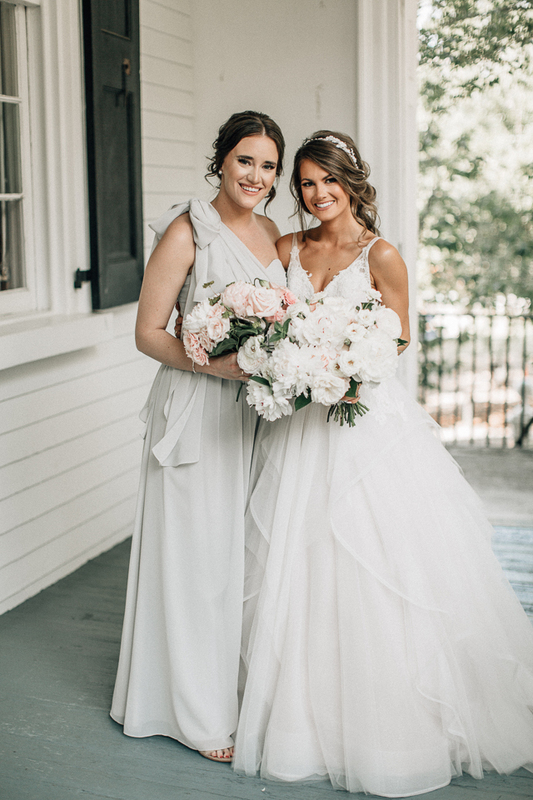 At this point, I was also starting to freak out internally thinking about walking down the aisle – I’m so thankful all of my friends were there to keep me calm!! Right when all the girls got there in the morning, I gave them all little gift bags. 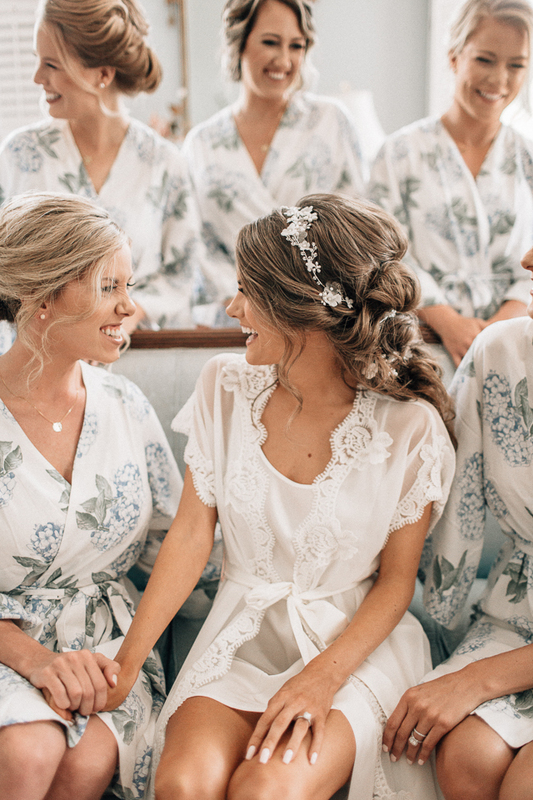 Each gift bag had a blue hydrangea robe for getting ready in and a mini monogram necklace from Love Always Couture – the girls are wearing both in the above photos. I ordered their robes from this Etsy shop – they have a ton of patterns, colors and styles (for instance, if you wanted your girls to wear pajamas rather than robes!) and I also like that you can buy items in bulk. 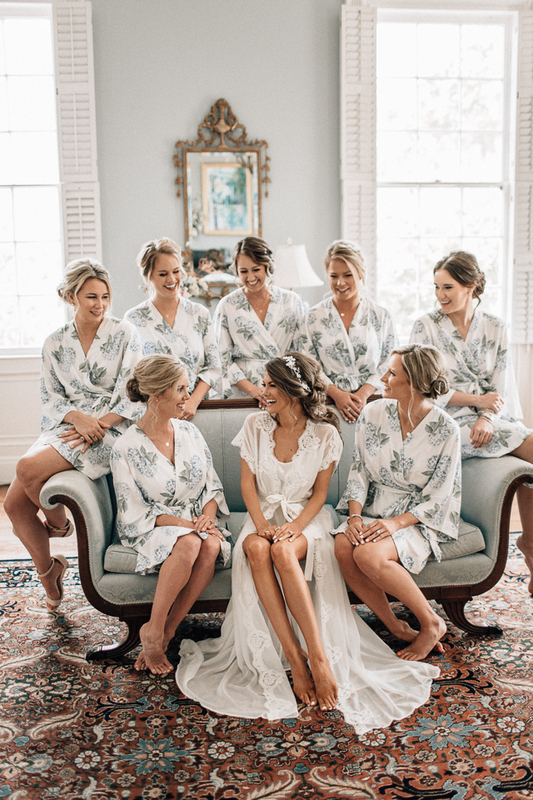 Since I had 7 bridesmaids, I was able to buy a bundle of 7 robes at a discounted price. I absolutely love how the robes turned out – in person and in pictures! 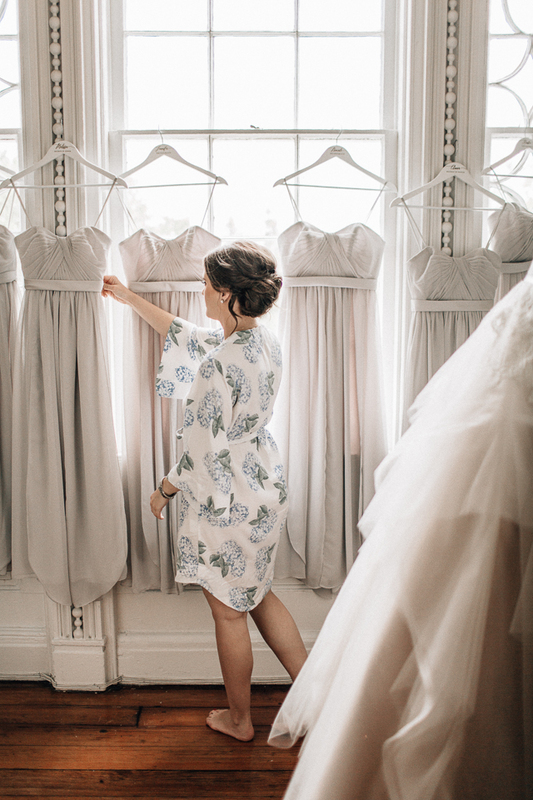 The blue hydrangea pattern was the perfect “southern” look for our Charleston wedding. 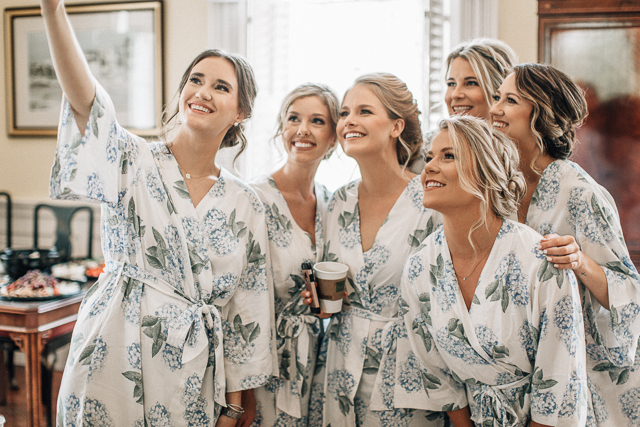 I also received a ton of questions about my getting-ready robe! 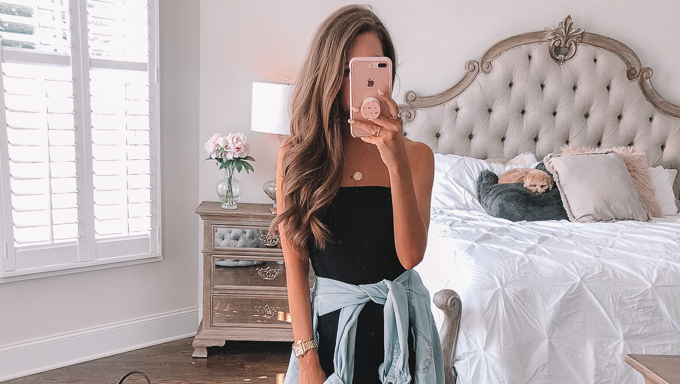 You can purchase my robe HERE (search for “Danika” robe), I ordered it in an XS! 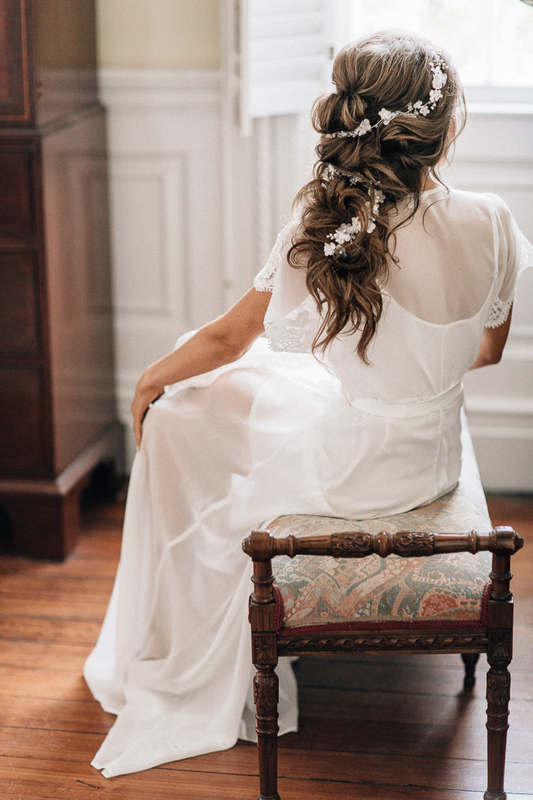 You may notice that I replaced the pink satin sash with a white sash – I took the white sash from a different robe. If you want to get the same look, you could go to the craft store and get a small amount of white satin fabric and create your own sash. Underneath my robe, I wore this white silk chemise. The next step was putting on our dresses! 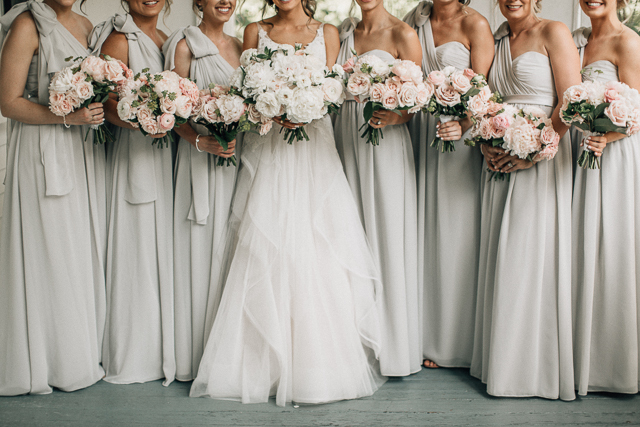 All of the girls got dressed in their Sorella Vita bridesmaid dresses (Style #8472 in the color “platinum”). 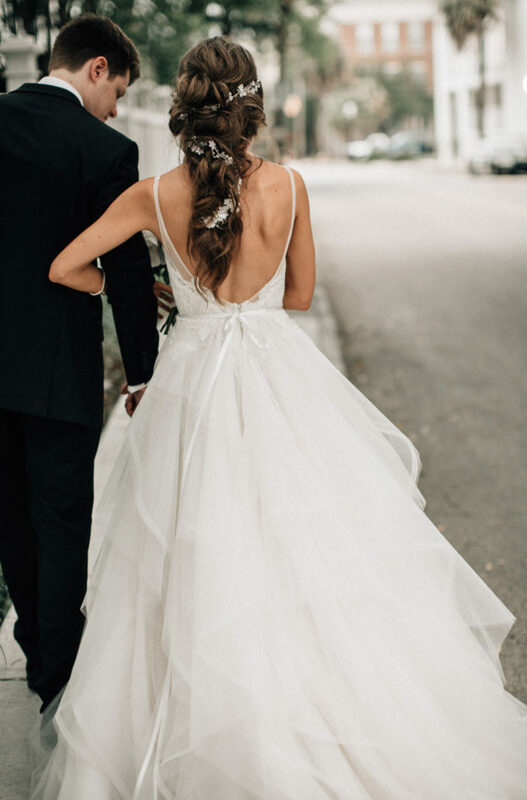 These dresses are convertible and can be worn multiple ways, but I love love loved the one-shoulder look! Especially with the bow on the shoulder. 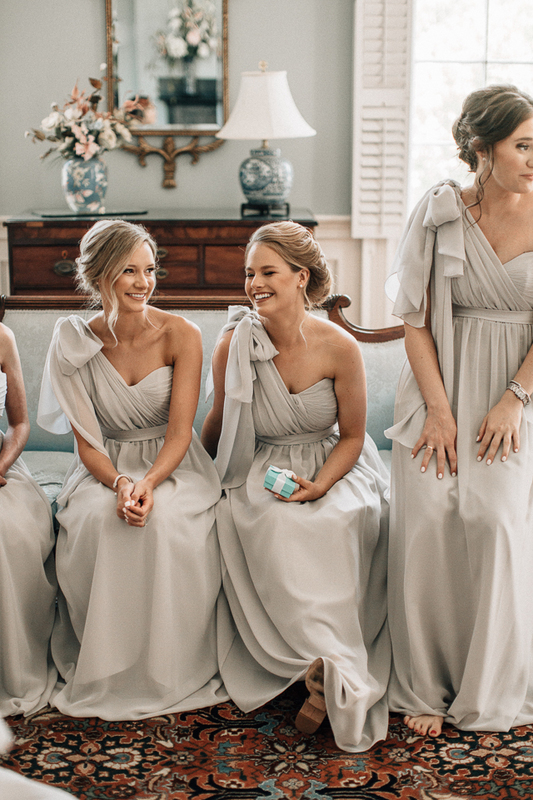 After we were all dressed, I gave them their final gift – the one I was most excited about!! I gave them all pearl bracelets from Tiffany & Co. The little silver heart tag can be monogrammed, so I had each one monogrammed with the girls’ initials. I wanted this gift to be really special and something that the girls would continue to use and wear in the future – and think about our friendship every time they did! I am honestly so thankful for my friends’ love and support… they have been with me through the ups and downs, and each one of them has played a significant role in my life and contribute to who I am today. And then – it was time!! 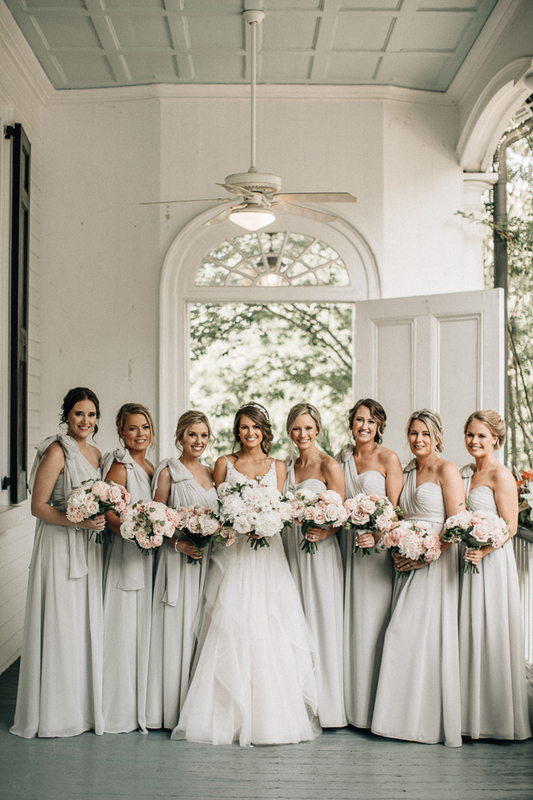 We quickly grabbed some group and individual photos on the front porch, and after that point, the entire day was pretty much a whirlwind. (A good whirlwind, I might add, seriously the best day of my life!!!!). 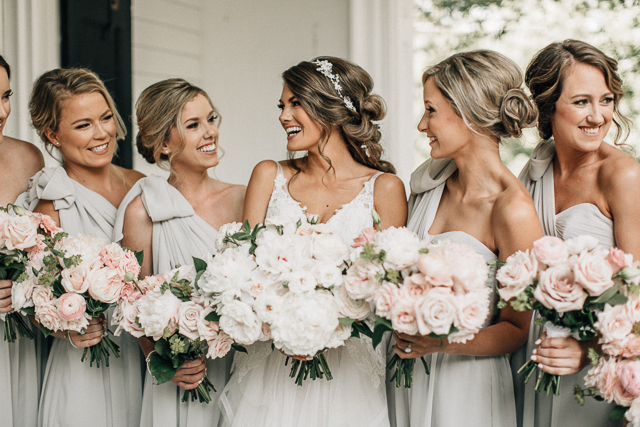 Like I said, if you have any additional questions about bridesmaids stuff, let me know in the comments! 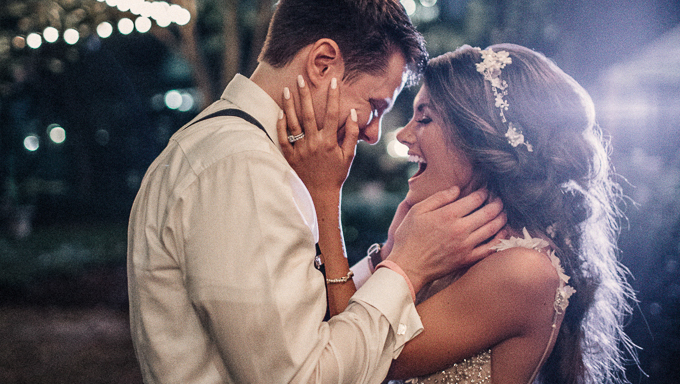 Also, if you missed my first wedding post, I shared a bunch of pictures HERE! Love this post! Some of the Etsy links aren't working (but some are!) but I love this! 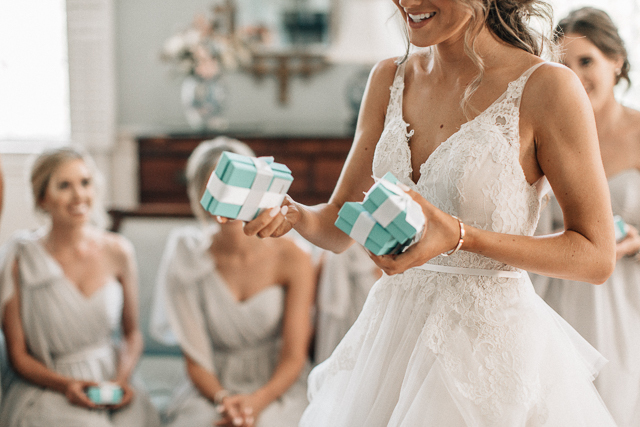 I'm a looooong way off from marriage or anything close, but I always loving seeing about the bridesmaids and especially the cute gifts for how to ask them! Ahhh love this post!! All the little gifts you picked out are so sweet and thoughtful, and you all look gorgeous!! What a great group of friends! This post is so fun! Love seeing photos of your wedding. Every pic is gorgeous! 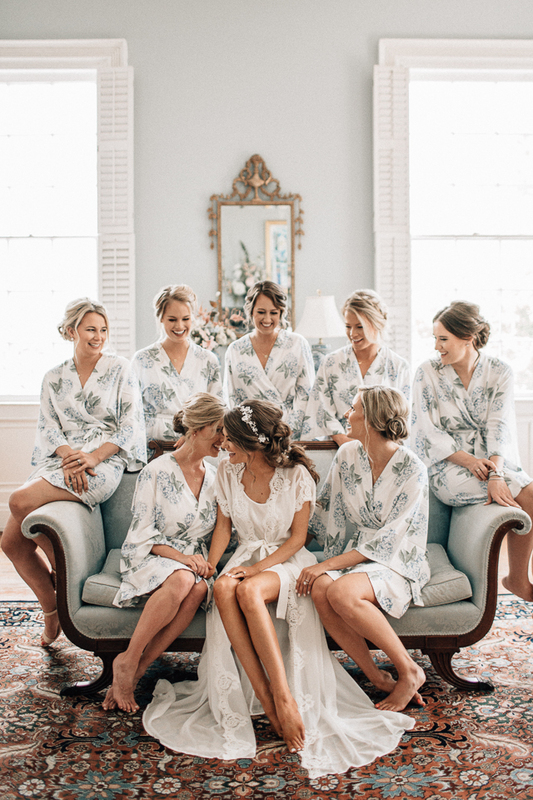 Adore those hydrangea robes… so pretty. Thanks for sharing. And congrats to Krista! will you do a book review soon? I would love that!! 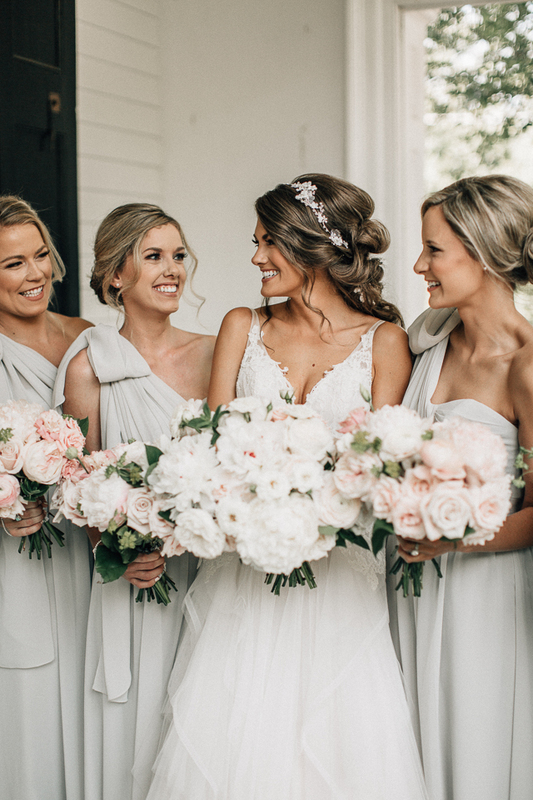 Your bridesmaids dresses perfectly captured that quintessential southern belle look! So gorgeous! 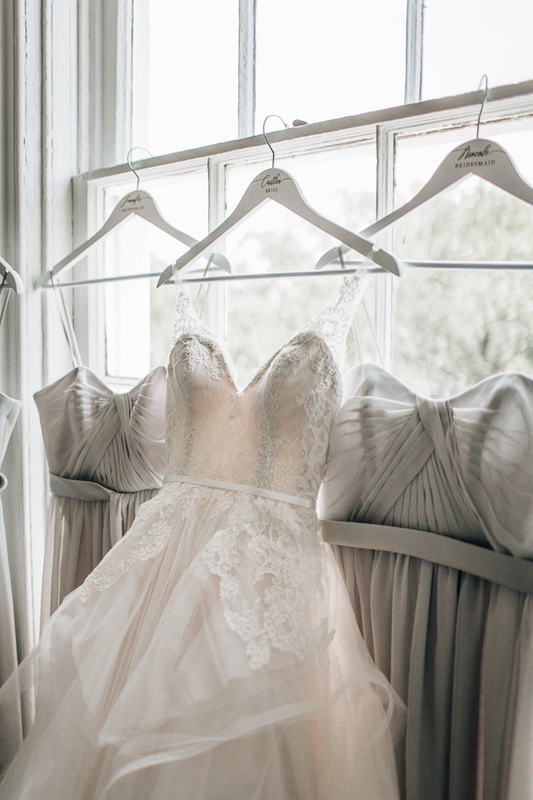 A beautiful wedding curated with enormous care and style! Love it!!! Bravo Caitlin. 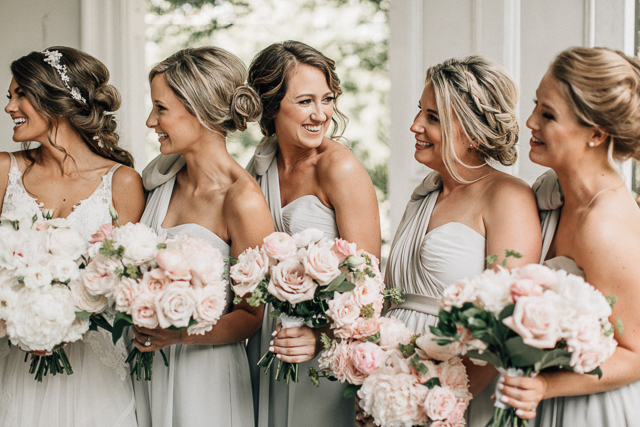 Love how you asked your friends to be your bridesmaids. 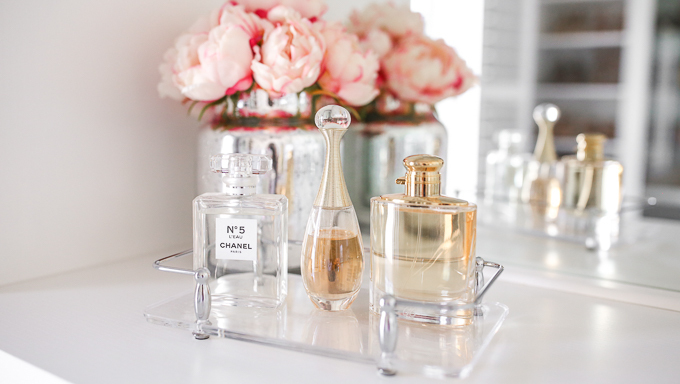 Oh wow- what beautiful gifts for your bridesmaids!! I'm sure they loved everything. Everyone looked great! WOO those bracelets are amazing and so sweet! I'm sure they were just floored by the generous gift! Keep the wedding posts coming! 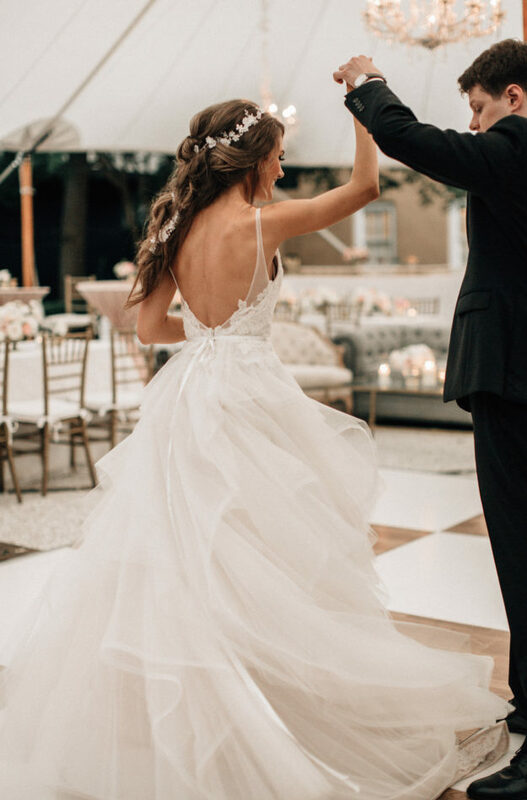 I'm 52 days away from my wedding day and I am just loving the inspiration! 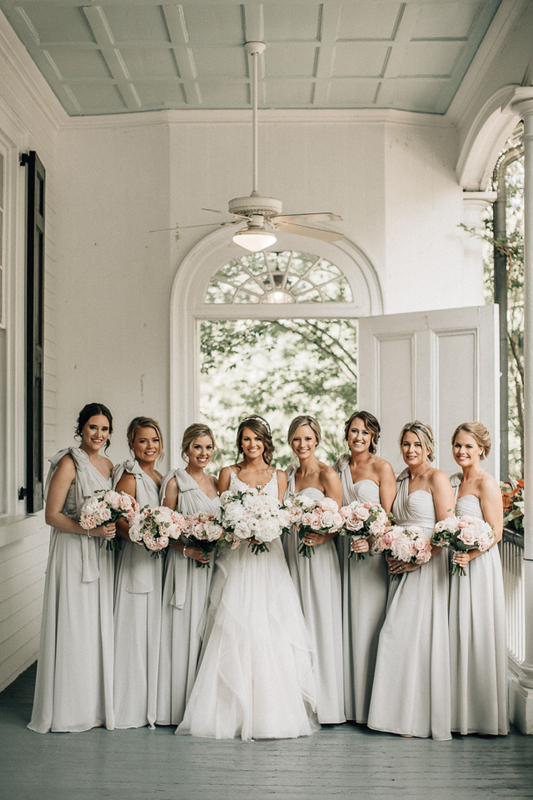 Lovely bride and bridesmaids!!!! The color of the dresses were just breathtaking!!! Thank you for sharing!! Aww what a precious post! Those pictures speak for themselves and all of you girls looked absolutely gorgeous! Wow you all look so beautiful ! 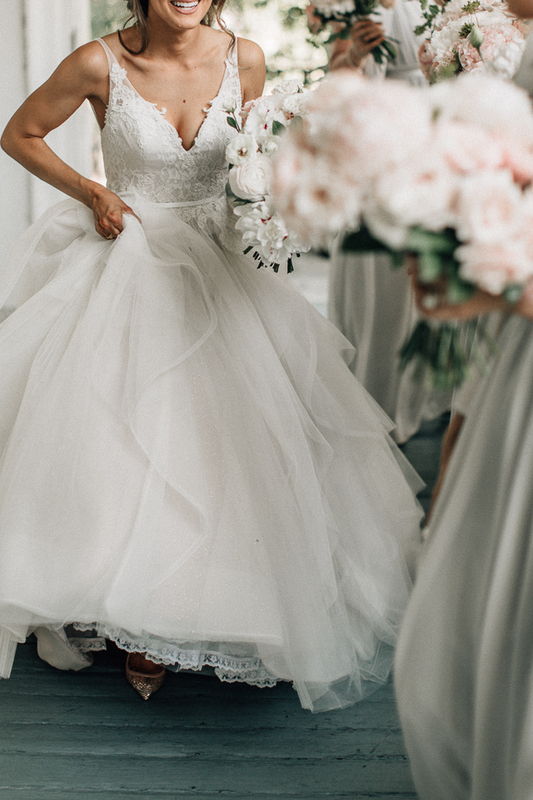 The dresses are amazing ! Hey Caitlin! 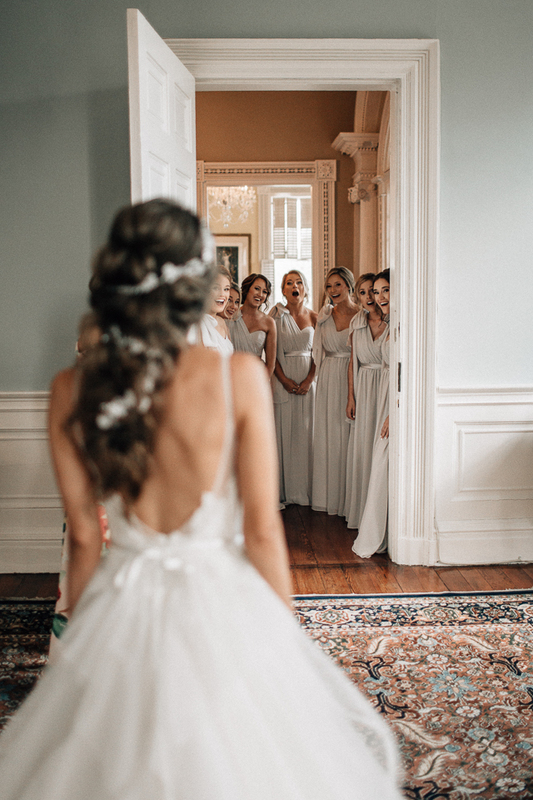 I loved this post – so cute to see you and all of your closest friends there to support you on your big day. 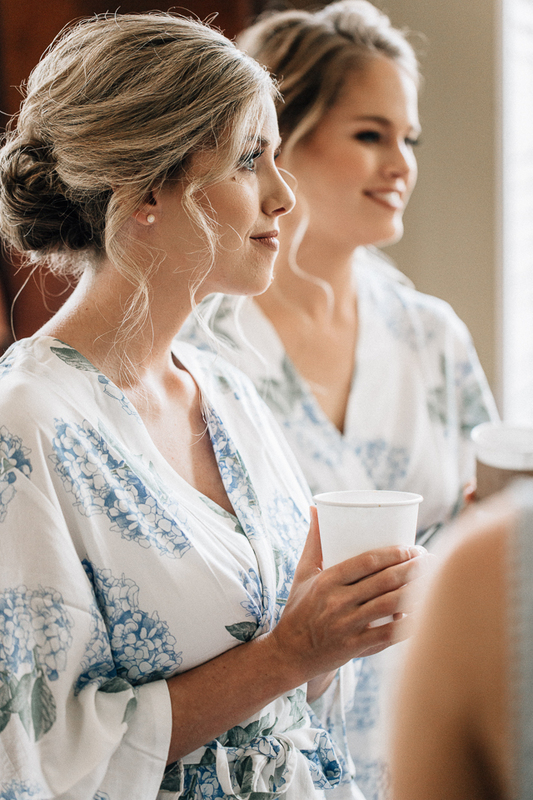 I am obsessed with the bridesmaids' pajama sets. Do you know if the pajama sets were they a comfortable material? Are they silk or more cotton like? 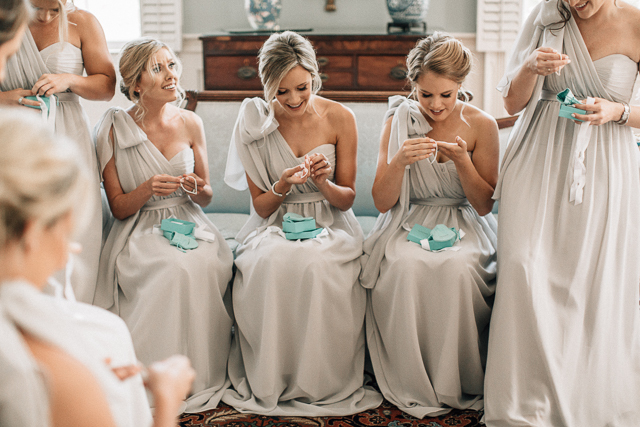 What color nail polish are you and your bridesmaids wearing? Seriously so pretty! 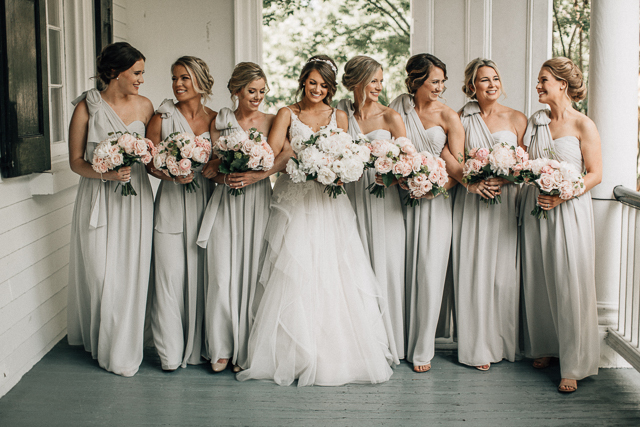 I wanted to ask, did you purchase the bridesmaids dresses or did the girls get it themselves? I have opted for a destination bachelorette and now I am guilt stricken since it’s certainly pricey! So I’ve been debating to get the girls’ their dresses, but I also have 7 bridesmaids and that adds up (esp bc I’m def paying for their hair/make up, robes and gifts of course)! Thanks !